In his marathon innings against Australia in the third Test at the JSCA stadium in Ranchi, Cheteshwar Pujara went past several landmarks with the most significant being facing 500 balls in his innings. With this, Pujara became the first Indian batsman to face 500 balls in an innings and joined the elite list of Rahul Dravid, Sachin Tendulkar, Sunil Gavaskar, Ravi Shastri and VVS Laxman to become the sixth Indian batsman to face 450 balls in an innings. Incidentally, Dravid is the only batsman to do this twice. He did it first when he faced 468 balls for his 217 against England at The Oval in 2002 and repeated the feat again when he countered 495 balls for his career-best knock of 270 against Pakistan in Rawalpindi in 2004, the previous best on the list of most balls faced by an Indian batsman in Tests. Opener Navjot Singh Sidhu comes in next with 491 balls for his 201 against West Indies in Port of Spain in 1997 and is followed by Ravi Shastri with 477 balls (201 runs) against Australia in Sydney in 1992 and Sunil Gavaskar with 472 (172) balls against England in Banglore in 1981. VVS Laxman (452 balls for his 281 against Australia) faced the least number of balls among the Indian batsmen who faced at least 450 balls. Pujara came in to bat in the 32nd over after the fall of KL Rahul’s wicket with the Indian scorecard reading 91-1. Pujara shared a crucial 102-run partnership for the second wicket with opener Murali Vijay before the latter was dismissed for 82 just before lunch on day 3. 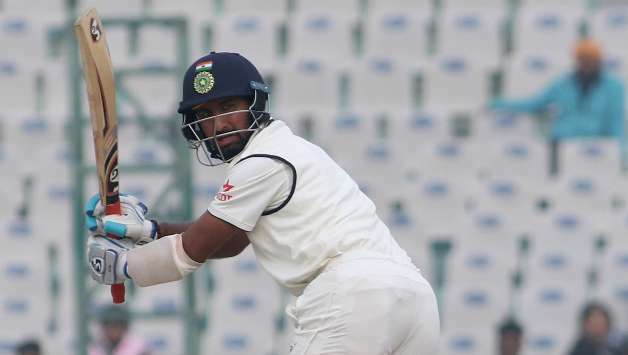 Pujara continued to grind out as he frustrated the Aussie bowlers and took the game forward. He scored his 11th Test century, batted throughout the day and looked solid at the crease at the end of day 3. Early on day 4, Pujara crossed his 150 and didn’t allow the Aussie bowlers to take the game away from India. He put on a 173-run partnership for the seventh wicket with Wriddhiman Saha. India are currently going strong at 503-6 with a lead of 52. Pujara has batted 505 balls and is batting on 189 with the help of 20 fours while Saha is just 1 run short of his third Test ton.